Just step out your door today and you will notice that poise is a rarity in our wired, fast-paced, and unmannerly world. As uncivil behaviors like flip-flops at Broadway shows and digital oversharing proliferate, this timely book reminds us of the quiet power of behaving with dignity, kindness, and grace. 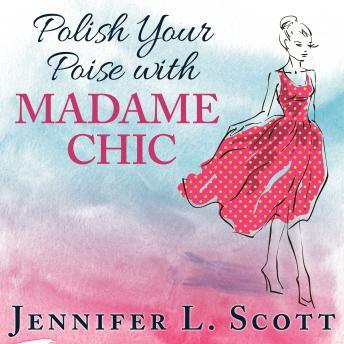 Jennifer L. Scott's Parisian mentor, Madame Chic, embodied poise, and not just with the good posture, stylish attire, and natural manners that made her extraordinarily elegant. She also demonstrated steady assuredness and graceful calm in everything she did, from interacting with her family and receiving guests at home to presenting herself in public. Jennifer passes on the lessons she learned as well as some of her own hard-won wisdom, addressing topics such as proper attire at social events, good grooming, communication skills, hospitality and being a good guest, our interactions with neighbors and strangers, role models, self-discipline, and self-image. This inspiring book, full of practical tips and ideas, is certain to start a new conversation about the timeless art of poise.